Ernest Anthony Puente, Jr., Tito Puente is internationally recognized for his enormous and significant contributions to Latin music as a bandleader, composer, arranger, percussionist, and mentor. Popularly known as the “El Rey del Timbal” and the “King of Mambo”, he recorded more than 100 albums, published more than 400 compositions, and won six Grammy awards. Although he played and recorded jazz and salsa, Puente is one of only a handful of musicians who deserve the title “legendary”, primarily for his mastery of the mambo. Puente has been credited with introducing the timbal and the vibraphone to Afro-Cuban music, Puente also played the trap drums, the conga drums, the claves, the piano, and occasionally, the saxophone and the clarinet. While Puente was perhaps best known for his all-time best- selling 1958 mambo album “Dance Mania”, his eclectic sound has continued to transcend cultural and generational boundaries. As a testament to his popularity with a younger audience, Puente has recorded with rocker Carlos Santana and has performed regularly at college concerts throughout the country. He has also appeared in several films, received a Star on the Hollywood Walk of Fame, and performed on television’s The David Letterman Show. Born on 20 April 1923 in New York City, Puente’s artistic talents first developed in the field of dance. In 1935, his sister Anna and he became members of “Stars of the Future” a neighborhood artistic organization. On four occasions, Tito was honored for his exceptional dance ability. After hearing a solo by Cuban pianist, Anselmo Sacassas Tito began his musical education on the piano. Occasional tutors were Victoria Hernandez, sister of Puerto Rico’s legendary composer Rafael Hernandez, and Luis Varona of the Machito orchestra who later would play with Tito’s orchestra. He also studied drums and idolized Gene Krupa. He later mastered the alto sax and was accomplished on the vibraphone. Puente then went on to work with Cuban pianist and bandleader Jose Curbelo beginning in December of 1939. Curbelo became his first music mentor and perhaps more importantly taught Puente the fundamentals of the music business. He then played with Johnny Rodriguez, Anselmo Sacassas, the musician that had inspired his piano study, and the great Noro Morales. In June 1942, he joined the Machito orchestra. Machito became Puente’s primary musical mentor. At one point Tito left Machito to play percussion for the Jack Cole dancers. Soon thereafter he was drafted into the Navy and served in World War II. He played saxophone and drums with the band on the ship. He learned how to arrange music from a pilot that played sax. After his discharge from the Navy in 1945 with a presidential commendation, he returned to New York to work again with Curbello, Brazilian band leader Fernando Alvarez, featuring Charlie Palmieri on piano, and Pupi Campo. He then began study at the Julliard School of Music. There he studied orchestration, conducting and music theory. In 1949, Puente formed his own band the Piccadilly Boys. In the 1950s during the Palladium era, Tito Puente’s band was one of the top three orchestras in New York City, along with the orchestras of Machito and Tito Rodriguez. Mambo and cha-cha-cha were the rage at the time. The music with its high energy became a catalyst for bringing together people of all races and ethnicities. Puente rode the wave of the mambo craze and went on to become a household name. Puente had strong leanings toward jazz which he “Latinized”. Puente later led two groups; an orchestra and a jazz ensemble. He continued to record both Latin jazz and straight-ahead Latin music with many different artists and his own bands. In 1970, Carlos Santana repopularized Tito Puente’s music with his rendition of Oye Como Va and in 1972, Para Los Rumberos. His last album: “Puente Caliente”, included classic Puente fare, such as the song partial Real Audio clip El Timbalón. In 1979, he won the first of six Grammy Awards for his “Homenaje a Beny” album which was a tribute to the Cuban singer Beny More. Other Grammy awards came in 1983 for “On Broadway”; 1985 for “Mambo Diablo”; 1990 for “Gosa Mi Timbal”; 2000 for “Mambo Birdland”, and “Masterpiece” in 2001. Puente was honored with a star on the Hollywood Walk of Fame in 1990 and was featured in the 1992 film “The Mambo Kings”. He was also given the National Medal of Arts by then President Clinton in 1997 and was honored by the Library of Congress in April of 2000 as a Living Legend. The New York Times chose Puente’s “Dancemania” as one of the 25 most influential albums of the 20th century. Other awards and honorary degrees are too numerous to list. In his lifetime, Puente recorded 120 albums, composed over 450 songs, and has over 2,000 arrangements to his credit. He had over 10,000 live performances around the world. Shortly before his death, he completed work on an album with Eddie Palmieri released 18 July 2000, which won Grammy for Best Latin Jazz. The legend died at age 77 on 31 May 2000 in New York City. All About Jazz musician pages are maintained by musicians, publicists and trusted members like you. Interested? 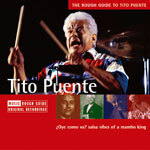 Tell us why you would like to improve the Tito Puente musician page.